Review Summary: On the whole RAJA KO RANI SE PYAR HO GAYA is neither a fantasy nor a love story. What happens when a dumb simpleton, a dumber city girl and a frolicking baby elephant come together? 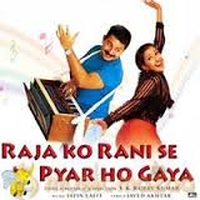 On the whole RAJA KO RANI SE PYAR HO GAYA is neither a fantasy nor a love story. Mohit (Arvind Swamy) is the son of a village Thakur (Goga Kapoor).